Ditch the store-bought stuff and make your own homemade ranch seasoning at home! 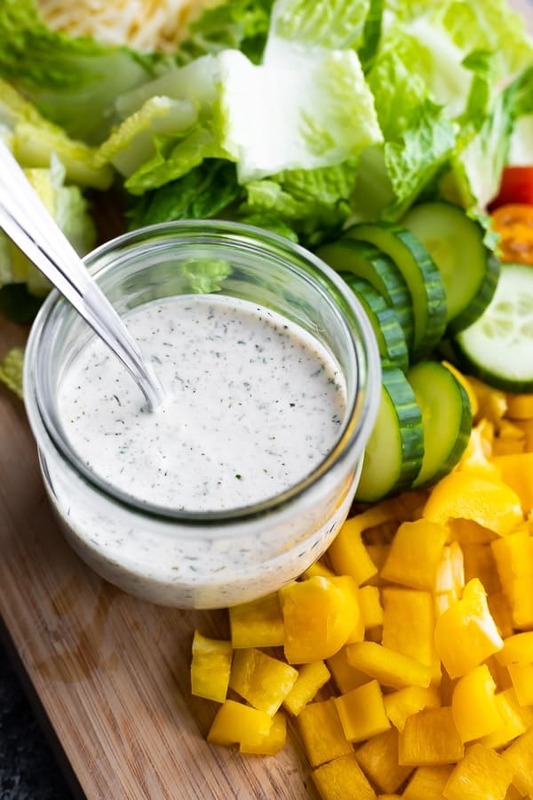 This ranch seasoning recipe makes a delicious (healthier) ranch dressing and is great on meat and veggies as well. 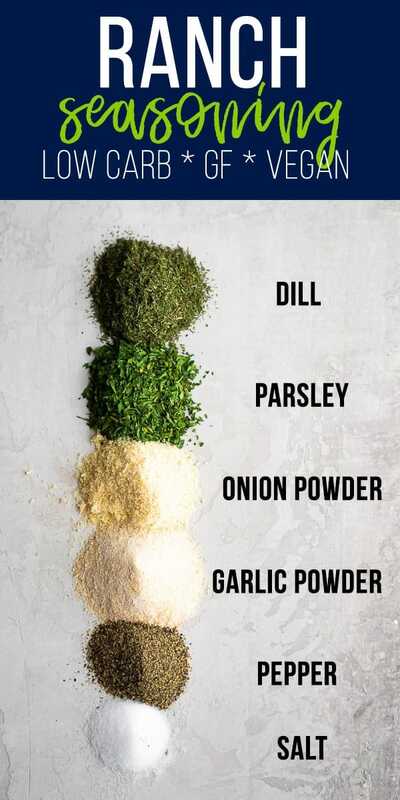 If you love ranch seasoning but not the crazy long list of ingredients found in a packet, you are in the right place. 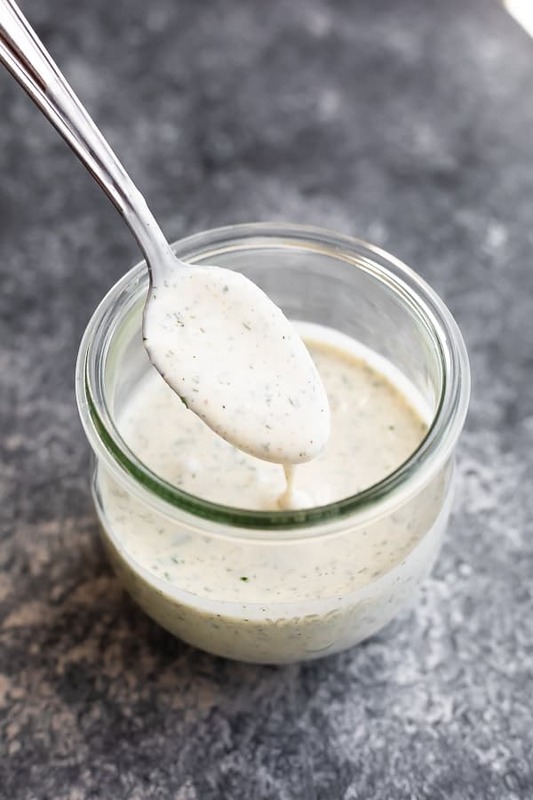 My homemade ranch seasoning recipe has just 6 simple ingredients, keeps for up to a year, and makes a KILLER healthy yogurt ranch dip. Ranch seasoning is delicious, there’s no doubt about it…just don’t look at the ingredients list too closely if you care for your health! You will find such ingredients as MSG, “artificial flavor”, which means we don’t actually know what the heck they put in there, and more. 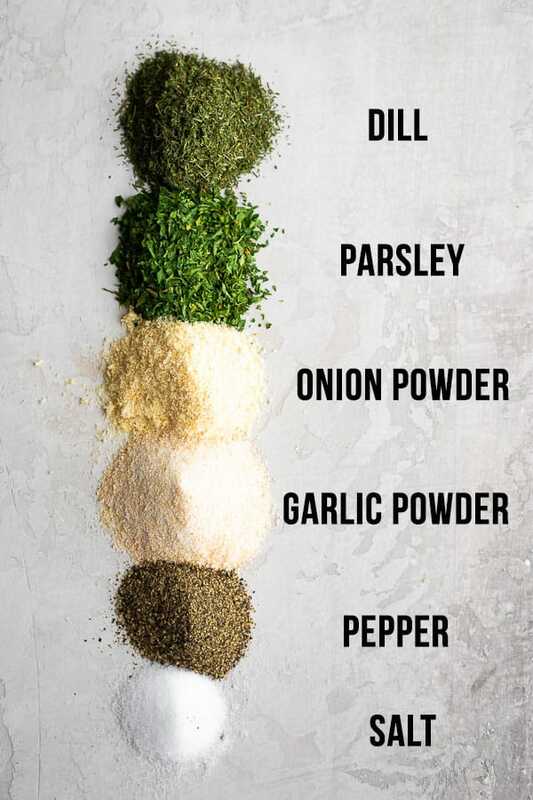 Why bother with that unnatural stuff when you need just six ingredients to make delicious ranch seasoning at home? It’s so so simple! You need six simple ingredients for this recipe. Many of these spices are already on my pantry staples list, so I just had to grab some dried dill and parsley and I was all set. What are some ways I can use this ranch seasoning recipe? Is this ranch seasoning recipe keto? Gluten-free? Vegan? 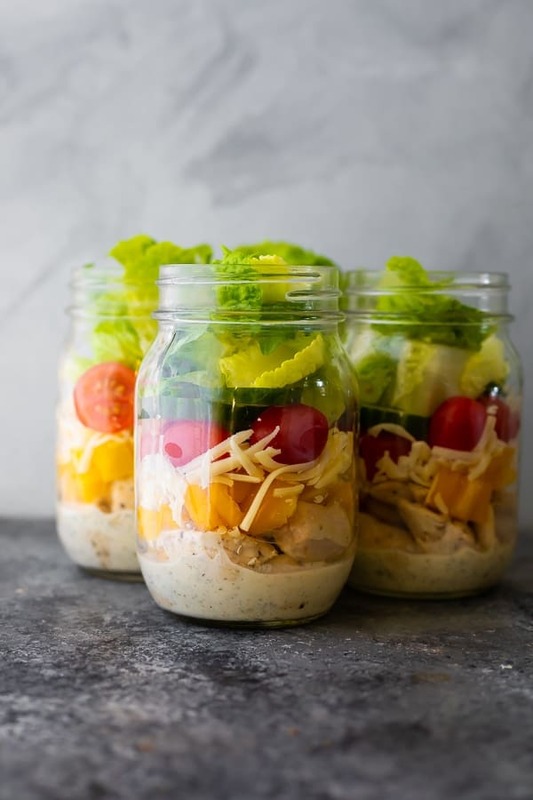 Keto- yes, with 1 g carbs per serving, this can fit into the keto diet. GF- yes! Vegan- while some ranch seasoning recipes contain buttermilk powder, this one does not, making it vegan. 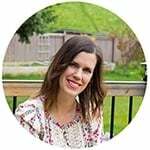 How much of this ranch seasoning recipe do I use in a dip? 1 teaspoon with 1/2 cup of yogurt works great. Dressing? 3 teaspoons with 1/4 cup mayo, 1/4 cup buttermilk, 1/4 cup plain yogurt and a squeeze of lemon juice. How long does this homemade ranch seasoning recipe last for? I would keep it for up to a year. It’s good for a long time! to get the ranch seasoning into the spice jar! 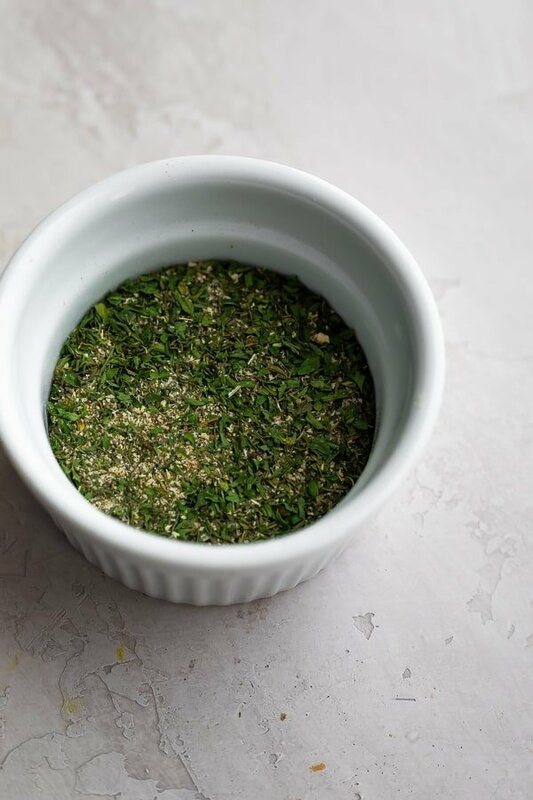 Ditch the store-bought stuff and make your own ranch seasoning at home! 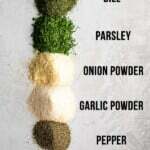 This homemade ranch seasoning recipe makes a delicious (healthier) ranch dressing and is great on meat and veggies as well. Stir together all spices. Store in an airtight container for up to 1 year.